SEOUL - The South Korean Defense Ministry on Tuesday said Tokyo failed in talks the previous day to provide definitive evidence backing its claim that a South Korean warship locked its radar on a Japanese plane. In the meeting “Japan did not disclose the radar frequency data that it has about our warship … and instead only asked for information from South Korea. Such a demand is extremely rude and unacceptable,” Choi said. She added that Tokyo’s attitude cannot be interpreted as anything else but a lack of desire to settle the matter. Regarding Seoul’s claim that the Japanese surveillance plane was flying menacingly low toward the South Korean ship, another key point of contention in the incident, Japan seemed to take some responsibility, Choi said. In response, Chief Cabinet Secretary Yoshihide Suga told a news conference that Japanese officials and South Korean officials have discussed “major issues” but “have failed to narrow gaps in understanding” over whether or not the South Korean destroyer locked its fire-control radar on the Japanese plane. Suga declined to comment when asked if Tokyo had shared electric wave data that could serve as evidence. The defense authorities of both countries held talks in Singapore on Monday over the alleged radar lock-on incident, which has chilled bilateral ties. Both sides said after the talks that they could not iron out differences over what happened in the Sea of Japan last month. No date was set for subsequent talks. Tokyo maintains that the destroyer locked its fire-control radar on a Maritime Self-Defense Force surveillance plane on Dec. 20. 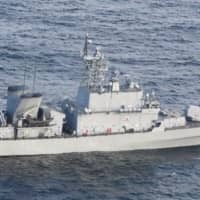 Seoul contends that the warship was merely using radar to search for a drifting North Korean fishing boat and has demanded an apology from Japan. Also Tuesday, Seoul removed a description labelling North Korea an “enemy” in its latest defense white paper, reflecting the dramatic improvement in inter-Korean relations over the past year. The move is in line with an agreement reached at the inter-Korean summit held in April last year to halt “all hostile acts” against each other. A South Korean government official said it would be contradictory to negotiate measures to resolve hostilities with North Korea while continuing to describe it as an enemy. The latest edition, however, still says the North’s weapons of mass destruction “pose a major threat to the peace and security of the Korean Peninsula,” a defense official said in a briefing about the white paper. The paper also mentioned the “high state of readiness” of South Korea’s army against an “unexpected provocation,” adding that the two Koreas will continue to build trust based on the military agreement signed during the third inter-Korean summit. Some Korean media outlets opined that the move reflects worsening bilateral relations over a series of court rulings on wartime forced labor and the radar incident.